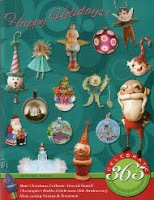 Happy Holidays: "Ready To Party"; the forgotten blog post. "Ready To Party"; the forgotten blog post. 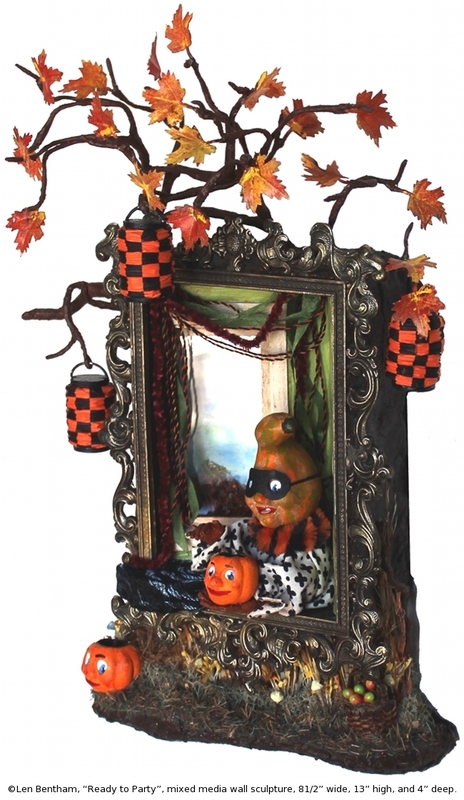 "I seem to be flip flopping between holidays, I am putting up Christmas decorations and writing about Hallowe'en." I was obviously very busy and totally forgot about the blog post. "Ready to Party" was posted last year in the September 2016 EHAG Emporium. So, better late than never, on with the blog post! 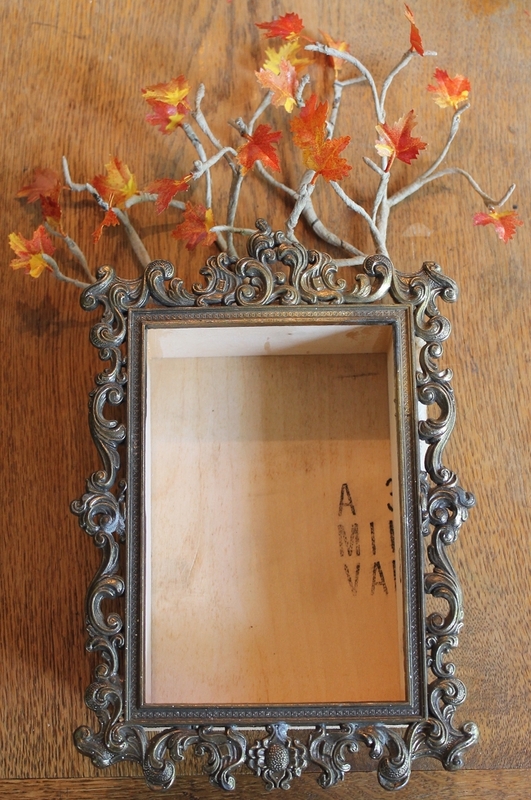 Early in April 2016 I built the shadowbox for this vintage Italian metal frame. I don't normally use plastic foliage but I liked these small maple leaves. The leaves were spray painted, then cut apart into individual leaves, wire was cut for the limbs, and then I began to construct the maple tree. I wanted to see how the tree would look with the sculpture and decided to photograph it. I don't design my sculptures beforehand, most of the time I don't even do a drawing. I have a concept and then just run with it. Items that have been made specifically for the piece are sometimes never used. The basic idea most of the time is there but working this way is much more fluid and the end product is far superior than if I was to sit and design the item from beginning to end. All of this languished in the studio until September when I had time to finish the sculpture. I love puzzles and this particular sculpture was a puzzle of grand proportions. 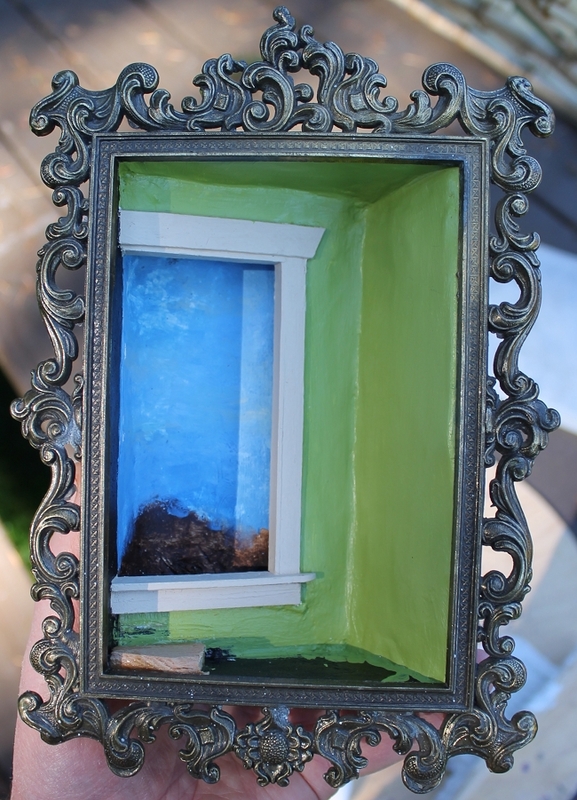 The shadowbox has the corner of a room in it with a window to the outdoors. The wall angle had to give me enough room for the landscape outside the window as well as give me enough room inside for Sigmund, the table, the decorations, and still be able to see out to the landscape. This thin plywood is the table that Sigmund rests his elbow on. 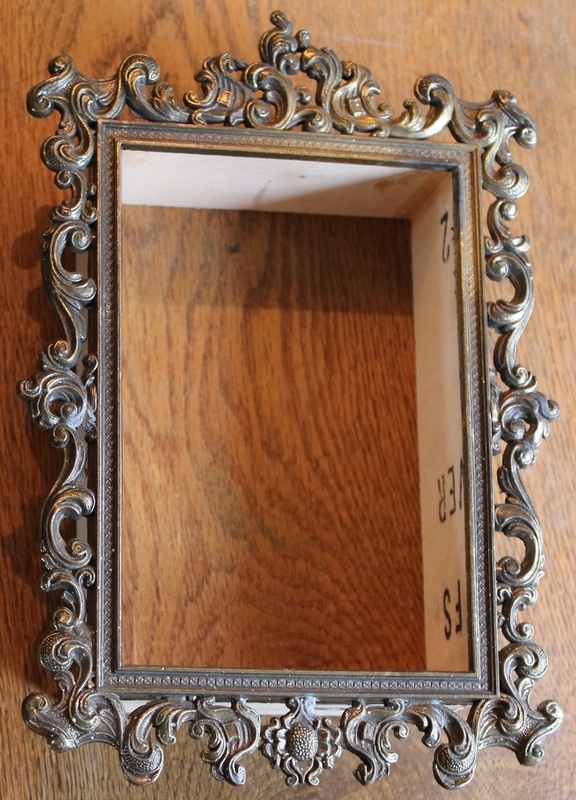 The pattern was cut and recut several times to assure that it would fit flush to the wall and around the metal Italian frame. The table top resting in place just to check proportions and table height. The puzzle of grand proportions that I was referring to involved the plywood backing for the sculpture. Originally the back of the shadowbox was one piece of plywood that would be glued to the back of the box. The problem was that I had to have the backing permanently in place to build up composition for the landscape, paint the background, and then add small bits of foliage. Installing the piece of glass for the window was the issue. How on earth do I have the back in place but still have it open so that I can insert the windowpane? 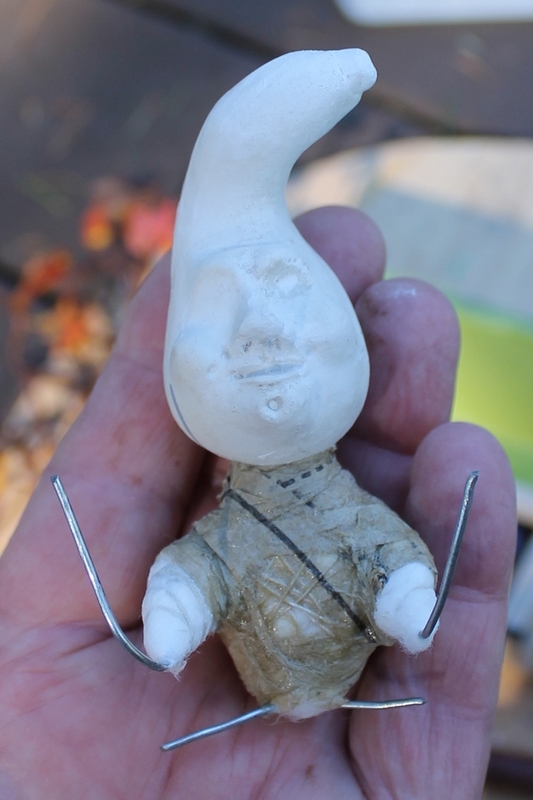 I had to leave the problem, work on other areas of the sculpture and let my brain sort things out. The solution was simple, but it did take a while to realize, cut the backing from top to bottom at about the corner of the room. 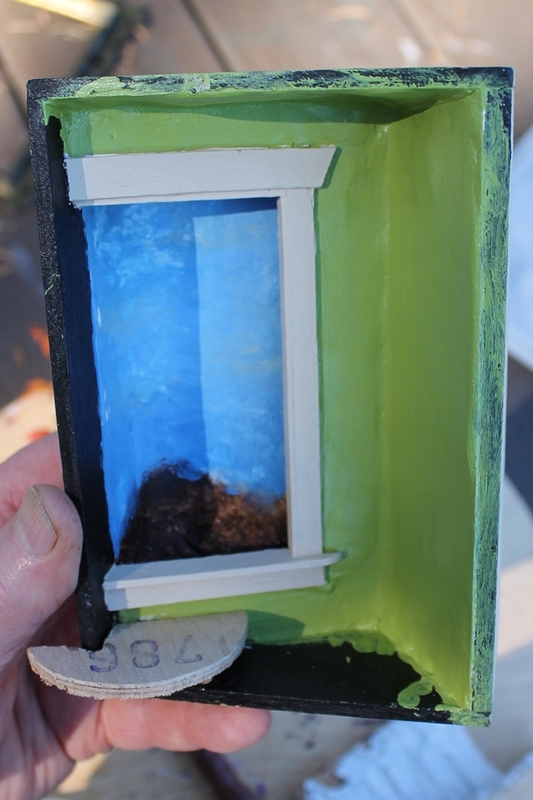 I was able to do the work on the landscape, install the glass, and then add the other section of backing plywood. I didn't take a picture of the back as I was working on it unfortunately, I hope my description of the process is clear. Three very small paper lanterns, about 1 3/4" high, were made to hang on the maple tree in the outdoor scene surrounding the metal frame. Vintage DMC perle cotton in three different colours of orange paired with black was used to make the cording. The cord, some fine green silk ribbon, and brown chenille yarn are used as garlands hanging from the ceiling. Sigmund in his very unflattering beginnings. The metal frame has been temporarily placed on the shadowbox to check that proportions and balance are working. Composition has been applied liberally to the base of the outdoor scene. The rough vertical texture was created with a spatula knife. Once it was painted the grasses and other plant material would blend into the background. A smooth back surface would have been harder to disguise. The base was attached to the underside of the shadowbox, the maple tree added, and the rest of the composition was applied. A full front view shows the finished sculpture. The lefthand side of the sculpture shows the interior of room and the view out the window. The grasses and other vegetation under the metal frame continues up the lefthand side giving a background to highlight the metal of the frame. A view of the righthand side of the sculpture, the trunk of the maple tree and foliage can be clearly seen. This sculpture is to be hung on the wall as the base is uneven. There is a self levelling picture hanger on the back for hanging. 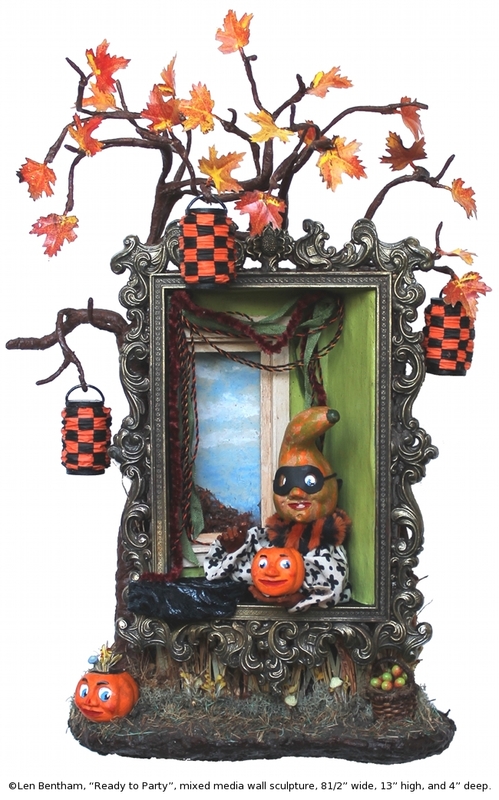 The overall size of this mixed media sculpture is 13” high, 8 1/2” wide, and 4” deep. $450.00 not including shipping, let me know where you live so that I can calculate shipping charges. The sculpture arrives duty free into the U.S. This is so creative! Great work, Len!